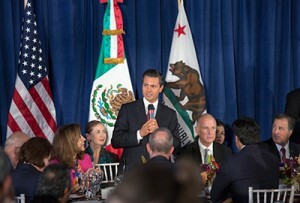 On the last day of his first trip to the United States as president of Mexico, President Enrique Peña Nieto visited the state capital, where he attended a luncheon and met privately with Governor Edmund G. Brown Jr. and o​ther elected officials. The luncheon and meetings build upon Governor Brown’s trade mission to Mexico last month. During his trip, Governor Brown met privately with President Peña and signed several memorandums of understanding on trade, education and climate change with Mexican officials. Members of the California Senate and Assembly attended the event, including Senate President Pro Tempore Darrell Steinberg (D-Sacramento), Assembly Speaker Toni Atkins (D-South Park/Golden Hill) and Senate President Pro Tempore Elect Kevin de León (D-Los Angeles). Also in attendance were members of the California Supreme Court, including Chief Justice Tani Cantil-Sakauye, and business delegates from the 2014 Gubernatorial Trade Mission to Mexico. The trade mission was organized by the California Chamber of Commerce with the assistance of the California Foundation for Commerce and Education. CalChamber’s support for Tuesday’s luncheon was acknowledged with thanks. M​exican dignitaries also were present at the lunch, including: Jose Antonio Meade Kuribreña, Secretary of Foreign Affairs; Sergio M. Alcocer Martinez de Castro, Undersecretary for Foreign Affairs, North America; Eduardo Medina Mora Icaza, Ambassador of Mexico to the United States; Ambassador Carlos González Gutiérrez, Consul General of Mexico in Sacramento; Ildefonso Guajardo Villareal, Secretary of Economy; and Earl Anthony Wayne, U.S. Ambassador to Mexico. 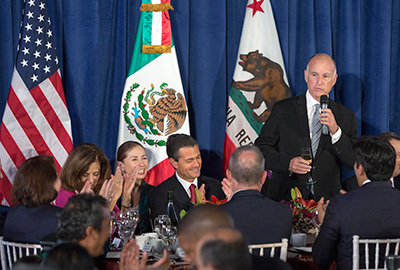 During the luncheon, Governor Brown welcomed the President to Sacramento and California. Brown began by saying that California and Mexico’s shared history and heritage is long and deep and continues. The President shared some of the subjects he and Governor Brown discussed in Mexico last month and will continue to discuss, such as education, infrastructure, and border trade and transportation. What is clear, President Peña said, is that the relationship between Mexico and California intensifies more and more each day. Commerce between the two economies totals more than $60 billion and it continues to grow, he said. In addition to this, Mexico is working to make the border safer and improve transit times, not only with California, but with other border states. During his remarks, President Peña said it is no accident that his first trip as President of Mexico to the United States is to California. California is the most important state that is inhabited by citizens of Mexican heritage, the President said, emphasizing that 12 million people living in California are of Mexican descent and one in three Californians are of Mexican origin. The President commended Brown’s approach to immigrants in the state, saying that the Governor’s efforts of respecting the human rights of all, regardless of citizenship, deserve recognition. Those who have made California their new home are all, women and men, good citizens, President Peña said. “They contribute with their efforts, with their talent, with their abilities, and with their daily devotion to whatever task is at hand for the development and greatness of the state of California,” he said. Toward the end of his remarks, the President shared that he hopes other states will follow California’s lead. Highlights of the California-Mexico mission are available in the mission blog.